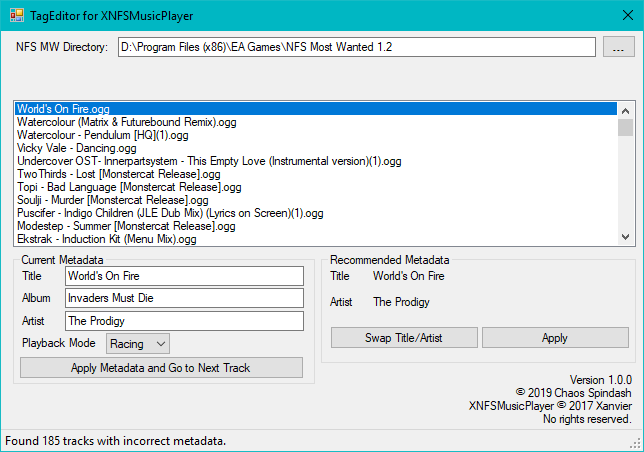 This simple, but useful tool helps editing the metadata displayed in the game when using Xanvier's XNFSMusicPlayer. Sometimes it happens that the mod cannot read the metadata of the files, especially with Ogg Vorbis, so it displays the file name as Title, the folder as Album and the track number as Artist. Editing the metadata for every track can be really time-consuming, particularly with large playlists. This tool can help with that by scanning and comparing the PlaylistConfig.ini with the playlist entries and will also recommend the most suitable info for being easily applied to the file. NOTE: I've tested this tool with playlists generated with AIMP. It should work with most playlists from music players which generate extended M3U playlists. If you encounter problems with your playlist, tell me.